NASA's twin Mars rovers, Spirit and Opportunity, have been on the surface of Mars for more than eight years. It's been more than a year since NASA's Mars rover Spirit last contacted Earth, and the odds that the immobilized robot will ever wake up get smaller by the day. Still, NASA engineers have more things to try before they give up all hope. Spirit's operators had been hoping that the rover, which has solar panels, would stir from its yearlong hibernation this month, as the Martian sunshine strengthened at its locale. But the solar energy available to Spirit peaked around March 10, researchers said, and the rover still hasn't made a peep since March 22, 2010. Rover engineers have been trying to contact Spirit for months, assuming that the increasing solar energy might rouse it from its Martian slumber. But that hasn't worked, and researchers have switched tacks, employing strategies designed to address possible problems with Spirit's communications systems and internal clock. "Now we've moved into 'There has to be more than one thing wrong with the rover,'" said John Callas, NASA's project manager for Spirit and its twin rover, Opportunity, at the Jet Propulsion Laboratory in Pasadena, Calif.
"So that's the phase we're in right now — trying to see what combination of things could've gone wrong that we can do something about." Spirit and Opportunity landed on the Red Planet in January 2004. The six-wheeled, golf-cart-size rovers were originally tasked with three-month missions to look for signs of past water activity on Mars. Both rovers delivered in a big way from their separate landing sites, finding lots of evidence that the Red Planet was once a much wetter, warmer place. In 2007, Spirit even stumbled onto evidence of hydrothermal systems on Mars. The find suggested large amounts of energy had flowed through some wet environments in the ancient past, making the emergence of Martian life a likelier possibility. Opportunity keeps adding to that total with every passing day. But Spirit's wheels stopped moving for good last year. The failure of its right front wheel in 2006 compromised Spirit's mobility, and it became mired in soft sand in May 2009. In January 2010, NASA declared Spirit's roving mission over and rededicated it as a stationary science outpost. The trapped Spirit rover went silent March 22, 2010, after failing to maneuver into a position that would have slanted its solar panels toward the sun over the course of the Martian winter. During that winter, Spirit's electronic guts probably grew colder than ever before. The frigid temperatures could have damaged any of several components, one possible reason that operators haven't been able to re-establish communication with Spirit, researchers said. Operators had hoped Spirit would wake up this month as it warmed in the increasing periods of sunlight. So NASA listened for signs of life from the rover, and engineers told it to phone home. After the March 10 solar maximum failed to rouse Spirit, the rover team changed tactics a bit. Now they're sending different commands, hoping to elicit a response from Spirit even if its two radio systems are damaged. "Maybe the rover's gone tone-deaf, and it's not hearing our requests to phone home," Callas said. "Or maybe it's mute — it is hearing our requests, but it can't talk to us because its transmitter is bad." So some of the revised commands — which began on March 15 — include instructions for Spirit to use a backup transmitter, and to be receptive over UHF relay to the signals from several NASA spacecraft currently oribiting Mars, researchers said. Another possibility is that Spirit's internal clock is scrambled. "It may not know exactly what time to wake up, and it may wake up at unusual times. So we've been covering those time periods," Callas said. "We've been going through all these combinations." If the new methods don't prod a peep out of Spirit in the next month or so, the team will try a new set of strategies addressing a new set of possible problems. But hope for Spirit's recovery will be mostly lost at that point, Callas said. "Those are things we should try as part of our due diligence," he said. "But that's likely to be done at a very low level of activity at that point. We will probably have arrived at a reasonable conclusion that the vehicle is not likely recoverable at that point." Even should Spirit not wake up, the rover will have left an impressive legacy of exploration and discovery. 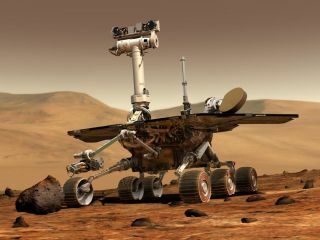 "The rover's had a fantastic mission," Callas said, noting that Spirit has made "some of the biggest discoveries about Mars since humans have been looking at the planet." If Spirit is indeed gone forever, the mood at JPL will doubtless be somber and reflective, at least for a while. But the rover team will still have plenty to keep itself busy — namely, driving Opportunity around the Martian surface. Opportunity, which has been making a long trek toward the giant Endeavour crater, is still doing fine. For the last few months, the rover has been poking around the rim of a Martian crater called Santa Maria, but it should soon resume its journey, according to Callas. "We really want to make a beeline to Endeavour at this point," Callas said. "The driving should be pretty good. We should be making pretty good progress over the coming sols [days] on Mars."